High Strangeness: Bedbugs in Space! 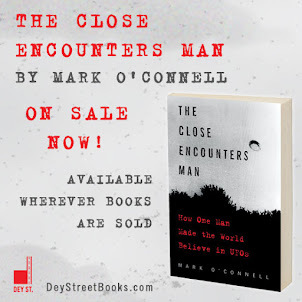 The other day I wrote about the secret deal MUFON's former leadership had signed with a supposedly "shadowy" Las Vegas businessman that would have allowed said businessman to have exclusive access to any and all physical evidence that MUFON's "STAR Team" might nab from the site of a UFO crash or alien encounter ("How Much Is UFO Evidence Worth? ", 2/7/2012). It turned out, in fact, that the STAR Team rapid response concept was created by MUFON at the behest of this businessman. All this for just $672,000! Easy to see why rank-and-file MUFONers were upset with the management for inking that deal. Why would we all risk our necks to secure UFO evidence only to have the MUFON high command hand it over to a shadowy Las Vegas businessman, who would place it in on a solid gold display stand at the center of his vast collection of beautiful and rare artifacts that only he can afford to own? Well, I did a little more research and the picture started come into clearer focus... This businessman actually owns a hotel chain and an aerospace company, and so naturally he wants to combine his two great loves and build the first space hotel (see image below). 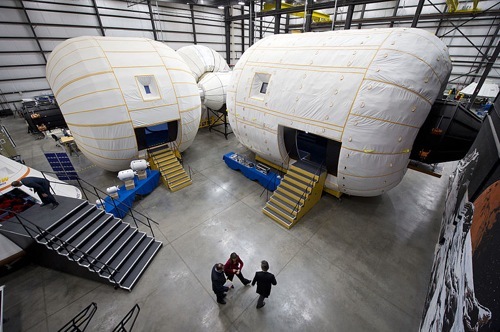 They call it a "space hotel," but it looks like giant marshmallows. Good luck with that. Good thing he doesn't own an aerospace company and a dog walking service. Now, you may be thinking that I'm talking about Sir Richard Branson, the brash, charismatic owner of Virgin this, that and the other thing, but I'm not. It's true that Sir Richard also owns both a hotel chain and an aerospace company, and wants to open the first space hotel, but I am talking about the other rich guy who owns a hotel chain and an aerospace company and wants to open a space hotel. I know, it's ridiculous that there are two of them, but apparently it's harder than you think to be a truly original and unique rich guy. Anyway, let's take a closer look at our rich guy, and why he wants exclusive access to MUFON's crashed saucers and alien corpses. He owns a hotel chain called "Budget Suites of America," and Budget Suites of America invites you to "relax and unwind in your own personal apartment whether you are a family relocating to a new city, a business traveler, vacationer, or just making a new start." If I was vacationing with my family in Las Vegas, Dallas, Phoenix or San Antonio, I would consider staying at a Budget Suite of America. Ditto if I was "making a new start." But we're not talking about Las Vegas, Dallas, Phoenix or San Antonio, are we? We're talking about a cold, dark, barren, lifeless void. Okay, not much difference there, I admit, but you get my point. Imagine this orbiting the earth. This worries me, for obvious reasons. If I'm spending my life savings to take a vacation in low orbit around the earth. do I want to stay in a place called Budget Suite? I think you know the answer to that one. 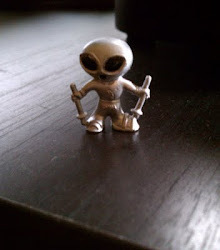 What if Mr. Budget Suites knows that space aliens are vastly superior to us in the intergalactic hospitality business? Wouldn't it make sense that he would want their knowledge and technology to himself, so that he could make his space hotel the earth orbit destination? Shame on you, MUFON management, for playing right into his hands. How many free weeks in space did he offer you? ?